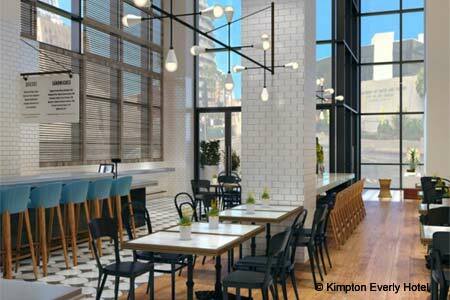 Kimpton Everly Hotel's stylish, airy restaurant offering elevated all-day dining in Hollywood. About chef Bryan Podgorski: Executive chef Bryan Podgorski worked with Thomas Keller at The French Laundry and then served as the chef de cuisine at Bouchon Bistro Las Vegas for nearly a decade. In LA he’s overseen the kitchens at Tanzy and Double Take, but at Jane Q his pedigree seeps into the seemingly casual Cal-Med fare with ease in dishes like burrata and poached pears with ginger honey, or a standout skirt steak sandwich with Gorgonzola dolce. The décor: Jane Q inhabits an airy space on the street level of Kimpton Everly Hotel in Hollywood. Two-story atrium windows let natural light wash over a clean, contemporary room that flows effortlessly to a sweeping staircase leading to the upstairs lobby. White subway tile frames the open kitchen, a long zinc counter and communal Carrera marble bar. Wood tables and chairs flank the windows for more intimate dining amidst the lively scene. 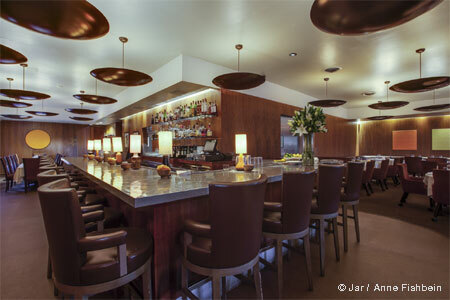 Likes: Stylish design of the soaring space; great people-watching; mixologist Dan Rook’s cocktails. Dislikes: Parking is scarce and can be a bit sketchy along Yucca Street. Food & Drinks: The restaurant offers changing seasonal specialties, and chef de cuisine Jason Hall usually strolls down the street to the Hollywood Farmers Market to root out the kitchen’s produce. Breakfast starts at 6 a.m., but expect late morning lounging over specialty drip and espresso coffee from LAMILL, and dishes ranging from smoked salmon rillettes on a toasted baguette to shrimp and grits with a poached egg. You can do a bit of sophisticated day drinking here with lighter aperitivo spritzes, Negronis and sangría on tap, or a wonderfully rejuvenating “Vodka, So...Duh” mixed with cold pressed kale juice, lemon cordial, soda and lemon. Local draft beer and a Central Coast-centric wine list round things out. The all-day lunch and dinner menu offers a host of lovely vegetarian dishes including charred cabbage with honey, local feta and pepitas; fried green tomatoes; or a creamily decadent avocado parfait that’s perfect to smear on house-made focaccia. At dinner, consider the savory black truffle calzone and duck confit cassoulet with heirloom beans. A smooth Valrhona Manjari chocolate pot de crème is the ideal finish alongside an espresso.